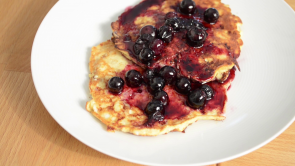 Justine Keyserlingk,, Personal Trainer and Holistic Nutritionist demonstrates how to make her Protein Pancakes with a Blueberry Maple Syrup Glaze, which are delicious, easy to make and contain added protein to help build muscle and keeps you feeling full longer. These pancakes are also sugar free and flour free. Using a blender, blend all ingredients in a bowl. Add to greased griddle or pan and cook 3-4 minutes each side, flip when batter begins to settle and bubble slightly. Add all Blueberry Glaze ingredients to a small pan and cook at low heat until blueberries begin to soften. Add glaze to pancakes and enjoy! Make sure to check out more of Justine’s videos in the food section right here on lifestylevideos.com About Justine Keyserlingk: Justine Keyserlingk is the owner of Just Get Fit which she began after she earned her bachelor’s degree in Education (Phys. Ed.) from McGill University – an honour and credential that has allowed her to excel as a teacher, coach, consultant, and communicator. Justine is a certified personal trainer and holistic nutritionist practitioner in the Greater Toronto Area. She has been practicing both as a self-employed personal trainer on location in clients’ homes as well as at various health and wellness facilities for over 5 years. She teaches group classes such as indoor cycling & muscle conditioning as well as run a fitness bootcamps out of Quad East studio in Toronto.